Played in 52 sets in her sophomore campaign, picking up 62 digs, 14 assists and two service aces … Her 1.19 digs per set ranked among the top six on the team … Her consistent serving abilities and strong serve receive capabilities made her a staple for the Seminoles’ back row efforts … She started off the season strong, picking up 11 digs against Illinois State, and then set two career records with 15 digs and three assists against UCSB on the same day at the Baylor Invitational … Supported the Seminoles’ defense at the Seminole Invitational by recording 12 digs and four assists over the course of the weekend … earned five digs and two assists to help the Seminoles beat Auburn in five sets … Recorded six digs and four assists in the team’s conference opening weekend to help defeat Virginia and Virginia Tech … Picked up five digs in the team’s five-set effort against Notre Dame … Appeared in 14 of the Seminoles’ conference matches, averaging one dig per set to close out the season. 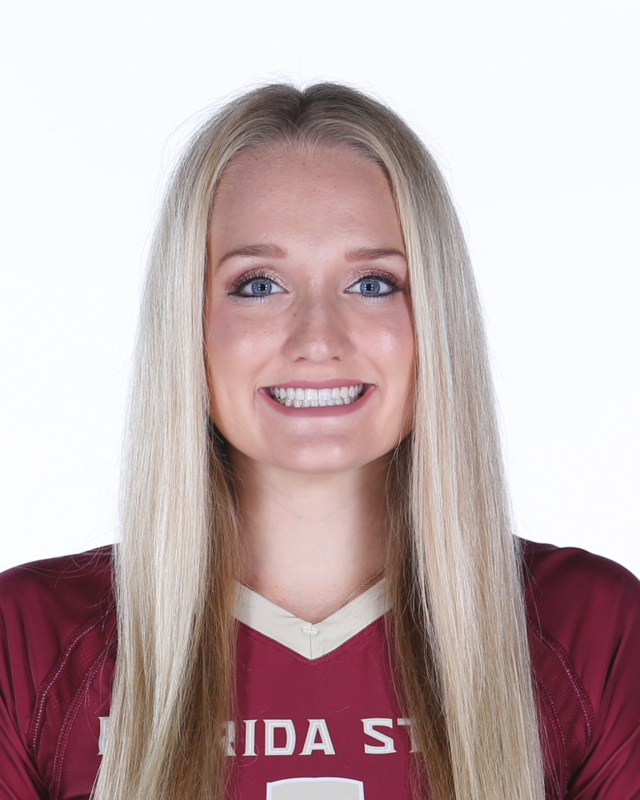 Capped off her freshman campaign by recording 93 digs over a course of 54 sets … her 1.72 digs/set ranked as the fourth-most on the team … notched six service aces, including four in ACC action, to help guide Florida State to 124 service aces … played a key role in the Seminoles’ success during league action as she came through with 44 digs (1.52 digs/set) … made her collegiate debut against UCF (Aug. 27), appearing in one set and recording one dig. Played three sets in Florida State’s clash with No. 6 Minnesota (Sept. 3) … wrapped up the Home2Suites by Hilton Tallahassee Seminole Tournament with two of her best performances in the early stages of the season as she recorded 12 digs in five sets against Baylor (Sept. 8) … followed that with an eight-dig outing versus Little Rock (Sept. 9) as Florida State completed the tournament sweep … played one set in Florida State’s win over Boston College (Oct. 2) … saw action in two sets against No. 12 North Carolina (Nov. 6) … played four sets for the Seminoles against Boston College (Nov. 11) where she came away with four digs, one kill and one service ace … keyed one of the most dominating performances of the season in the second set against Syracuse (Nov. 13). She took over in serve for the Seminoles and came through with a service ace as Florida State and remained in serve as the Seminoles scored nine straight points, stretching a 7-3 advantage to 16-3 … cracked the starting rotation as she recorded a season-best 14 digs and added one kill at Duke (Nov. 18) … closed out a win at Wake Forest (Nov. 20) with five digs as she made her second career start … had five digs and one assist in the Florida State victory over Clemson (Nov. 23) … ended the regular season with her third double figure dig outing (11) in a five-set win against Georgia Tech (Nov. 23) … made her NCAA Tournament debut against Cincinnati (Dec. 2) where she was integral on the back row with four digs … started five sets of Florida State’s win at Florida (Dec. 3) and emerged with eight digs … tied her season-high in digs (14) in the season finale versus Stanford (Dec. 9) while making a pair of service aces. A three-year varsity player under head coach Mark McGiveron at Duncan U. Fletcher High School in Neptune Beach, Fla. … a solid defensive specialist who was named as a Tenth Team Defensive Dandy by prepvolleyball.com in 2015 … that honor came on the heels of back-to-back honorable mention accolades for Defensive Dandy by prepvolleyball.com in 2013 and 2014 … named as her team’s 2015 Defensive Player of the Year … received Duval County Scholar/Athlete Award of Excellence following her senior season (2015) … recognized as a Fifth Team High School Academic All-American by prepvolleyball.com (2015) … named 2015 All-First Coast Team as a libero in 2015 … delivered a pair of District Championships in 2013 and 2015 for her Duncan U. Fletcher High School program … instrumental in guiding the Senators to Gateway Conference Championships on three occasions (2012, 2013, 2015) … capped off her senior season with an appearance in “Sweet 16” in the 7-A Florida High School Athletic Association volleyball tournament. Competed with the Team Florida High Performance unit for two seasons (2014, 2015), an elite program that competes against other High Performance USA Volleyball teams … helped the Team Florida High Performance squad, coached by Adis Imamovic, bring home gold at the National Championship in Des Moines, Iowa (2015) … followed that up with a second place finish at the 2015 European Global Volleyball Challenge which featured matches against Team BIP-Southeast in Pula, Croatia … participated in USA Volleyball Junior Nationals during the 2012, 2013, 2014 and 2016 seasons. Born June 10, 1998 … daughter of Carmon and Michael Sullivan … majoring in exercise science and pre-med … Member of SAAC for 2018-19 school year … also has one sister (Kendal) … member of the National Honors Society, where she served as a historian as a senior, as well as National Spanish Honors Society … graduated in the top three percent of her class at Duncan U. Fletcher High School, earning a Cambridge AICE Diploma … served as her class president for all four years of high school … four-year member of the Interact Club and also member of Mu Alpha Theta, which recognizes those with strong backgrounds in math.